When space is limited, or your soil is really compacted or you are renting and a vegetable garden is on your 'wish' list than this is perhaps the best way to achieve that goal. Since 1975, Esther Deans' classic books No-Dig Gardening and Leaves of Life have inspired thousands of people to grow their own vegetables and flowers at home in areas where this may not usually be possible. 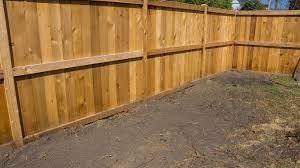 In this post details will be given on how to construct your no dig garden. The principle with no dig gardens is to have a good mixture of carbon materials in the form of straw and nitrogen in the form of manures. Water each layer lightly because the garden needs to be moist to function properly. The construction is rather like making lasagne - built layer by layer. Select a sunny, level spot, which will get at least 4-5 hours of sun a day. 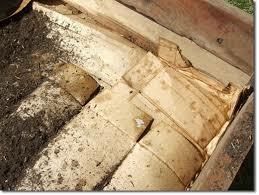 Mark out the area and edge it with bricks or any other material that will contain the soil when it is built. Four square metres is a good size to start with, but this of course can be increased if needed over time. 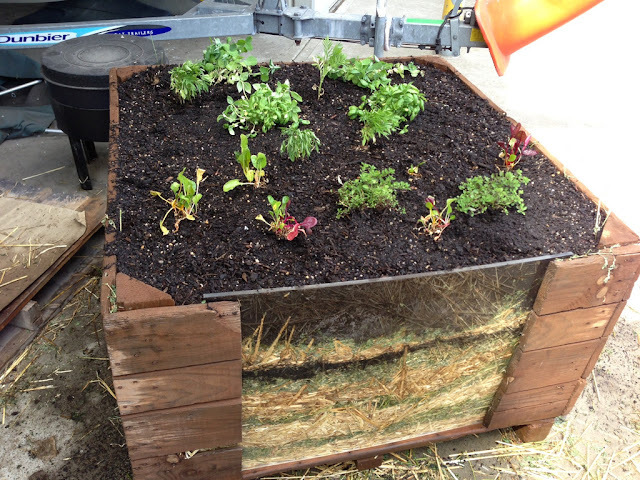 If building over an existing garden bed or soil, no additional preparation is required. 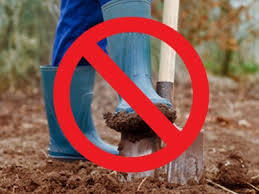 If building over concrete, paving, rocky ground or other hard surfaces, lay down a 7-10cm layer of bark, twigs, small branches, leaves or other dried matter first. This layer helps with drainage so water doesn't pool on the hard surface and create a waterlogged soil. You can also add dried seaweed to this layer. If building over lawn or grass, you can mow the grass very low first, or just leave it. Next fertilise it with plenty of blood and bone and lime watering it in well. The fertiliser will help the grass rot down once it is covered up and buried under all the layers that will go on top of it..
Cover the entire area with a wads of newspaper half a centimetre deep to smother any weeds, making sure that the newspaper is well overlapped to prevent any weeds from growing through (do not use coloured paper). I know someone who had a refrigerator delivered and used the cardboard as an additional layer on the ground before the newspaper was set down. The paper has to be very wet so it will start to break down immediately. Cover the area with the carbon layer - generous pads of lucerne hay which will break down easily and add vital nitrogen to the bed. Pea-straw or crop-straw like rye or canola may be used and of course for our area sugarcane mulch works a treat and is fairly inexpensive. Water the straw layer lightly. Next apply a layer of organic fertiliser - well aged chicken manure is excellent because it has high amounts of nitrogen, which helps in the breaking down process of the high carbon materials. However, any farm manure will perform this function, whichever is the most economical for you. If you don't have a lot of the manure mix, this layer may be boosted with blood and bone, which is also high in nitrogen, calcium and phosphorous but low in potassium, so supplement the mixture with about 10% of sulphate of potash or woodash. Add a 20cm layer of loose straw (carbon). 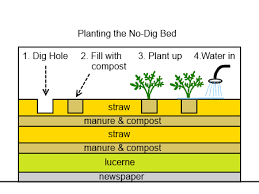 Add another layer of manure and again water lightly - you can continue to add as many layers as you wish to 'fill up' your bed. 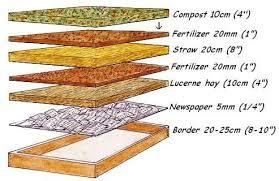 The last layer is good compost so that plants, seeds or seedlings can be planted. 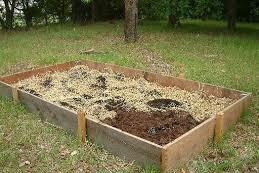 If there is enough available, the whole surface area of the garden could be covered with compost to around 10cm. Alternatively pockets of compost can be created for planting so that it can support a new plant while the new garden is breaking down. If you have a worm farm some castings added to this final layer would be terrific. There are some proponents who recommend that the bed is left to 'do its thing' before planting up. However, if you are an impatient soul it is best to grow established seedings in a new no dig garden. The best plants to use are shallow rooted plants or annual flowers and once the garden is more mature deeper rooted crops and plants can be added. Our good friends, worms will be attracted to this wonderful garden bed and will do their 'thing' by aerating the layers. As the layers break down top up with fresh layers of organic matter.